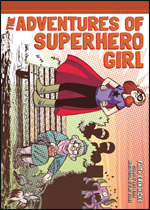 Superhero Girl started as a comic strip for a weekly newspaper in Halifax, the Coast, before it was put together as this beautiful, hardcover compilation. It follows the trials and tribulations of a girl who happens to be a superhero. I came across it while hunting for strong, feminist characters for my 8 year old daughter. Like all younger siblings, she tends to idolise and follow her older brother who is ten and deeply committed to reading anything that is vaguely super heroic. But I wanted more for her than Batman and Superman, and I wanted it to be grounded in something she'd be able to relate to. A tall order, I thought, until I came across this graphic novel. Although it is aimed at older kids, I found my eight year old thoroughly enjoying it, as did I. What is not to love about a superhero girl who doesn't know her own strength and at times knocks over trees while trying to save kittens? She lives the everyday life most of us live and has laundry disasters like her cape shrinking in the wash. She makes the obsessive lists many of us make and realises that while she has super powers, she has not yet saved the world, nor does she have that superhero standard - an arch nemesis. She also has an existential crisis when she realises that she doesn't have the requisite tragic backstory. And she's been known to forget to take off her mask after a day of work, and go to the library in it. Apparently superheroes can be very absentminded. So yes, it's a parody of all that is superheroic, but it does it's leg pulling in a gentle way. She's in her 20s and needs a job, has a roommate, and sadly has run out of the grant the Canadian government paid her to do her job. Which isn't much, given that it is crime-free Canada. The art work is neat and rather retro, adding hugely to the appeal of the storyline. The panels are clean, there is none of the excessive overlapping and added effects that make a page visually distracting and busy. Cute, funny, endearing, heartwarming - this is a comic book that girls of all ages, as well as boys, might truly enjoy.